The eighth week of the Procés Trial was marked, in the procedural plane, by the testimony of members of the Catalan autonomous police and the continuation of the strategy of exacerbation by part of the defendants and, in the political plane, by Jordi Sánchez’s request to hold an electoral debate in the correctional facility in which he is being held; we will analyse both issues below. The Mossos d’Esquadra played a leading role in the sessions held, both due to the appearance of the institution’s own high officials and the testimonies offered by different members of the Guardia Civil and the National Police who alluded to the passivity of the autonomous police during the holding of the referendum. The first session, on Tuesday, ended with the shocking story of the head of the Provincial Brigade of the Judicial Police remembering the scene in which one of the mossos responsible for the operation deliberately and actively hindered the action of the National Police, preventing their passage while shouting “let them vote”. On Wednesday, the number 2 of the Mossos, Ferrán López, while trying to defend his subordinates, he discredited the defence’s argument, assuring that the top brass of the Generalitat was completely aware and warned of the possible violent drift of the day, going so far as to assure that: «Puigdemont said that if that scenario that we foresaw [scenario of violence] took place, he would declare independence at that very moment«. This statement was corroborated by Commissar Joan Carles Molinero, who reproduced in identical terms the conversation between Trapero and Puigdemont. These cross-examinations would confirm the thesis that violence was being used by the Generalitat as an instrument to achieve independence: if violence was achieved, independence could be declared. However, there is nothing to prevent the accused from using this as a defensive argument: if independence was going to be declared if there was violence, and if – as they maintain – it was not declared, this would mean that there was no violence. We’ll have to wait. In these eight weeks of Trial, we have seen what it means to be the defendant in a procedure that is, a priori, «lost». The notoriety of the facts being tried implies that the accused have a very much reduced defence arsenal. In the same way, the evidence that all the actors involved in the Procés not only admitted, but probably deliberately sought a scenario of violence as a means to arrive at a declaration of independence, is really overwhelming. Thus, a large part of the strategy of the defendants focuses on driving the development of this procedure before the Supreme Court to the most likely appeal before the ECHR of Strasbourg. It is enough to observe how celebrated -or at least well known- criminal lawyers repeatedly try to upset the Court, with their eyes set on a procedural challenge before the Constitutional Court or the ECHR. It would be otherwise difficult to understand the attitude of lawyer Mr. Pina in the development of the cross-examinations. First, while interrogating a civil guard who intervened at the Dosrius polling station, and after asking him if they had approached a peaceful citizen who was wandering around the area, the FCSE member replied no, to which Mr. Pina said «but I’m seeing it on the computer». And this with the sole aim of bringing up the videos that the Court has already said it will watch when appropriate. Such twisting of the rules governing the cross-examination of witnesses had to be stopped by the President of the Chamber, who said with elegant irritation: «Mr. Pina this is not serious, do you want to testify yourself?». On the other hand, during the cross-examination of another civil guard who intervened in Dosrius and was injured, he decided to read his medical report but omitted the parts in which reference was made to the specific injuries, thus trying to imply that there was no harm done. Faced with this, the Civil Guard asked him to continue «reading down«. The lawyer, against his will, could not help but go as far as the extracts of the part that evidenced the existence of injuries – some of a certain harshness -, exposing his puerile and sectarian interrogation that also earned him the reprimand of Mr. Marchena for the misleading nature of his questions. In any case, until now, none of these practices of dubious professionalism has managed to rile the Court in a way such as what was probably sought by the defenses; who knows if trying to emulate that famous sentence of the National High Court that was annulled after the President of the Chamber stated «well, I already knew he was not going to testify«, when one of the defendants availed himself of his right not to testify. 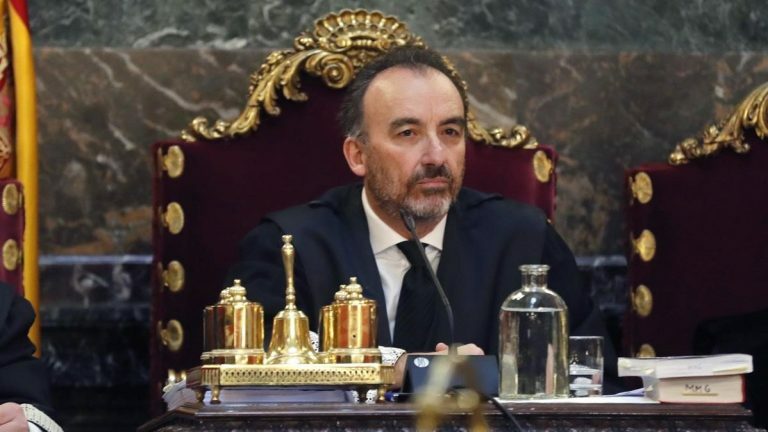 Far from it, as we have analysed throughout the series of blog posts, the actions of the Court and, more specifically, of its President, Mr Marchena, have come close to impeccable. Is pre-trial detention compatible with the exercise of political rights? As we said, last week we learned that Jordi Sánchez, who is part of the candidacy of La Crida Nacional per la República for the next elections to the Spanish Parliament, has requested permission to hold an electoral debate in the prison of Soto del Real. The Central Electoral Board has declared itself incompetent on the grounds that it is for the Supreme Court to decide whether such action is compatible with provisional detention; although it has pointed out that the opinion of the General Secretariat of Penitentiary Institutions in similar situations has been negative. At the same time, almost all the defendants that are held in provisional detention are candidates to wither the national elections, the local ones or the European elections. This raises a multitude of questions about the compatibility of their procedural situation (in pre-trial detention and the oral trial ongoing) with the exercise of their political rights: debates, participation in campaigns, collection of election certificates, participation in the chamber from which they have been elected, and so on. All these questions will have to be answered by the Criminal Chamber of the Supreme Court, with the exception of issues raised by the rebel defendants (Puigdemont, Comin, Ponsatí, etc. ), which will be for Judge Llarena to tackle since the oral trial has not been opened for them due to their procedural situation of rebellion. Although we will stop to analyse them when the time comes, we would now like to draw attention to a judgement by the Administrative Chamber of the Supreme Court in which some criteria were offered to assess the scope of political rights with respect to candidates subject to criminal proceedings. The judgement, which refers to a case in which there is already a conviction, cites comparative law and emphasizes the necessary social exemplarity required of those who hold public office, especially as representatives of citizens. Specifically, for example, it highlights how in Denmark a person cannot be eligible if he or she has been convicted of acts which in the general opinion make him or her unworthy of belonging to Parliament. We will see how the Supreme Court decides and how it weighs all conflicting rights; whether these are compatible with the situation of pre-trial detention and with the nature of the acts for which they are prosecuted. And all this, of course, until the judgement which, in the event it finds the accused guilty and since there is no possibility of appeal against it, will be final and would impose the loss of the status of Members of Parliament for those who are found guilty.